FTC disclaimer: I received samples of the product for review and crafting purposes. I have always loved stickers. I can remember in the 1970s, before sticker collecting became popular, I stapled some paper together and wrote on the front sheet "My Sticker Book". My grandmother was working at a Christian bookstore and brought me some stickers one day, and I said, "I need to get my sticker book." She said stickers were not for books. Well, we both are right. It's fun to save stickers and look at them (I still have my sticker collection from the 1980s) but it's also fun to make some crafts with them and share them with others. 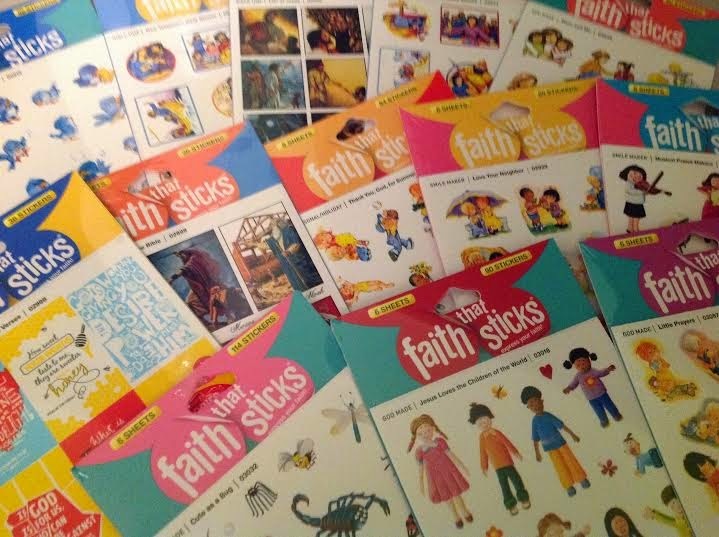 Recently Faith that Sticks sent me an amazing collection of stickers to review. There were so many fun packages of stickers. What could I make with them? 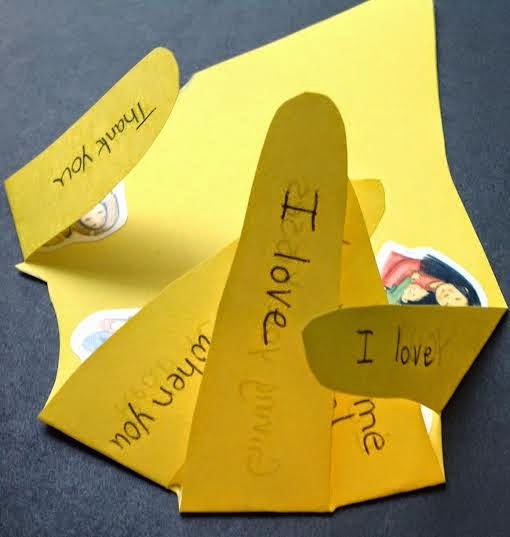 The package of stickers of children praying made me think how I have at times wished I would have kept more of a record of what I prayed for and then later be able to look back and see how God answered. This would be a great and simple craft for a time of new beginnings -- spring, a new school year, January 1, a birthday. Just write what you pray for on slips of paper and drop in there. The next year open it and see how many were answered! There was no doubt what I would do with the God's Armor stickers. 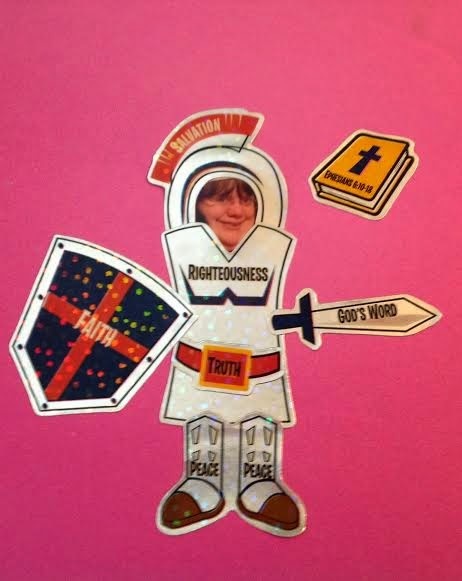 This would make a great Sunday School craft for when teaching on the armor of God. 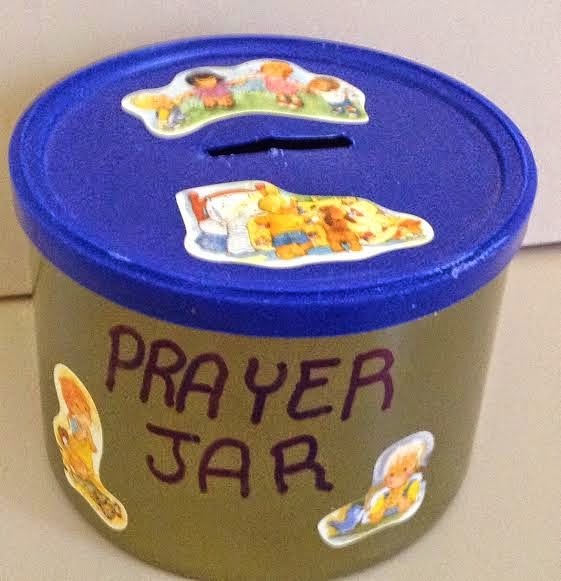 An inexpensive photo frame and you'll have a great take home reminder to help the Sunday School lesson "stick". I always loved scratch and sniff stickers when I was little. Tyndale House doesn't make scratch and sniff, but they do have "Stick and Sniff" where the scent is infused into the sticker and you can smell it without scratching it. They have three different types -- roses, flowers, and jellybeans. I remember in first grade my teacher made a card for all of us to sign for a boy who had his tonsils out. We loved to sniff stickers so much that she had to tell us to stop because there wouldn't be any scent left for him. So, I decided to make a simple craft with these because of how well loved scented stickers are. 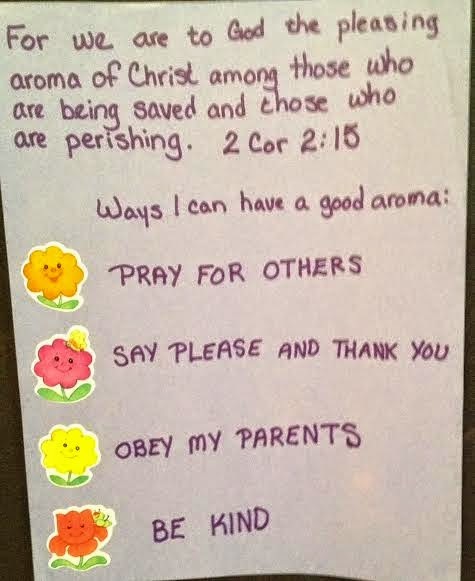 I used the verse about us being the aroma of Christ and children could write ways they can be that aroma to others. 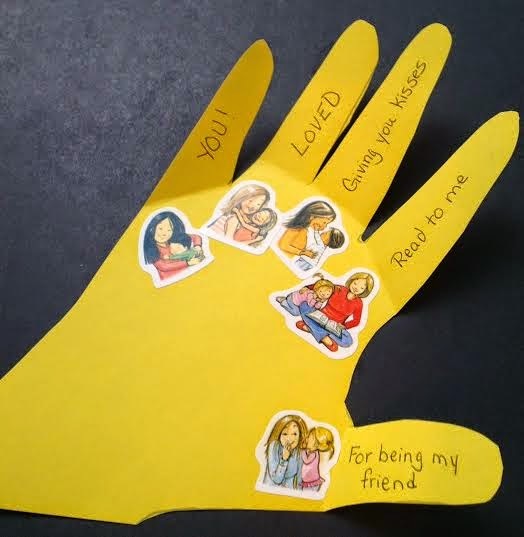 The set of Mom and Me stickers seemed to lend themselves great to a Mother's Day card. 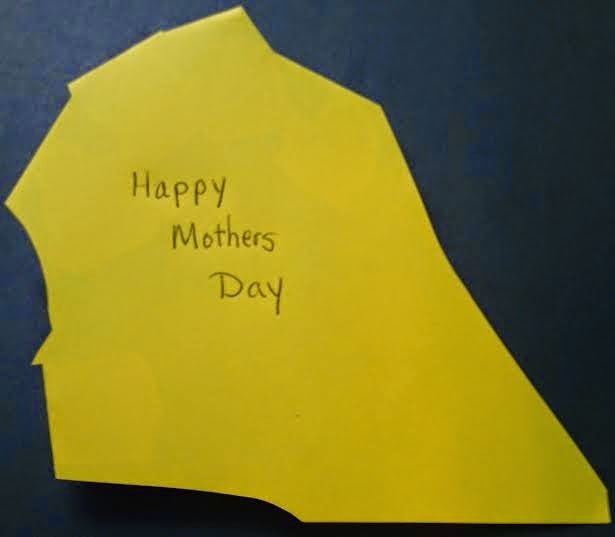 But folded card are just so conventional, so this would be a great keepsake card. I know I sometimes look at tracings of my hand from when I was little and it amazes me I was that small. I started memorizing Bible verses because of VBS. Over the years I have memorized huge sections of Scripture. One thing I wish would have been started with me when I was a child was any verse I memorized being written down on an index card so I could review it. At first there wouldn't be many but after years there would have been hundreds, and with me possibly thousands. 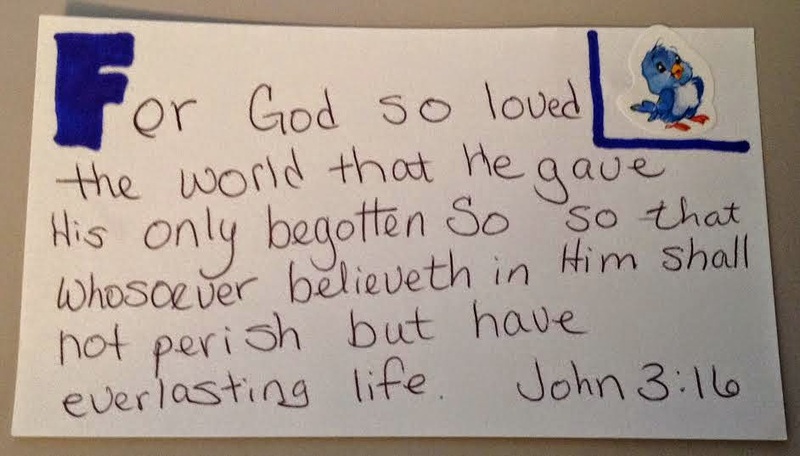 I thought about a way to incorporate stickers into Scripture memory at least for a younger child. I came up with the idea to have a box where a sticker would be place when the verse can be quoted. An added bonus if you are homeschooling you could teach alphabetical order using Scripture memory cards. Or you could ask the child to file them away in order they are in the Bible. One thing that my church always did when I was growing up was all VBS offerings were for missions. Also, there was always a competition. Not to see how much money was brought in, but to see if the boys or the girls would win on how much the offering would weigh. That meant pennies were the thing everyone wanted to bring in. But every year, no one ever thought about saving pennies before that week. So why not make a missions penny bank? Even if your VBS doesn't weigh the offering, it is a great way to remember that what doesn't seem like a lot to us can mean so much to others. There are so many fun stickers that are made by Faith that Sticks. I noticed they have some that say "Happy Birthday, Jesus". That is the theme of my church's VBS this summer, so I'll have to order some of those. Remember those stickers I told you about my grandmother getting me in the 1970s? Do you know how surprised I was to see they still utilize some of the same designs in their Inspirational Motto package. At an average retail price of $2.49 for usually either five or six sheets, these stickers are a bargain. They are also acid free so you can use them in scrapbooking. And now for the Giveaway. Open to the USA 18 and older. Winner has 48 hours to respond to the winning e-mail or another winner will be chosen. I like the Easter stickers. I like the it's spring stickers. I would like the Happy Easter for the children in our Sunday School. They would love these. I like the Fruit of the Spirit stickers. I would use these on the cards and notes I send to people at my church. I like the Smile Maker - Everyday Encourager. I think everyone needs this. I've loved sitckers forever! Penguins were my favorite, I still have a box of assorted sitckers I use for cards even sending out bills. The Faith stickers are very nice for gift and cards and crafts. the Counting Sheep stickers are my favorite ones.